Volvo in a new position statement instructs collision repairers to only have windshield replacement done by an authorized Volvo location, using only OEM glass and its approved adhesive. The OEM cited the windshield’s traditional structural role as well as the demands of newer technologies like advanced driver assistance systems and head-up displays. 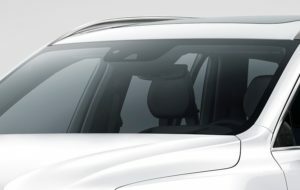 “The Volvo windshield is an integral part of our vehicles,” Volvo wrote in what appears to be one of a few new position statements. “Not only does it provide for an undistorted view, it serves as a critical structural component of the vehicle. Volvo said OEM-approved adhesives “will ensure proper bonding of the windshield to the vehicle’s body providing the same strength qualities as if assembled at the factory, providing a minimal safe drive-away time once installed.” It said aftermarket windshield services “may find it quite difficult to properly recalibrate” the camera and radar located behind the windshield, a task required after any new glass was installed. Aftermarket glass itself might not be up to the “extremely stringent optical tolerances” needed for advanced driver assistance systems tied to that camera and radar, according to Volvo. Volvo’s head-up display takes this a step further by requiring a different glass manufacturing process altogether, according to Volvo.